Monday was probably my last chance to celebrate Lincecum Day at AT&T Park in 2013. Tim Lincecum is scheduled to pitch at home just once more, against the dreaded first-place Los Angeles Dodgers, but I have no plans to attend the game. I decided the odds for a positive outcome were better against the Colorado Rockies, and I was right. While the San Francisco Giants offense didn’t come through in time for Timmy to get the “W”, we beat Colorado in a 10th inning walk-off thanks to a single by Brandon Belt. Despite the win, the Giants were officially eliminated from the National League West pennant race on Monday. For some reason, this development was not announced over AT&T’s P.A. system. 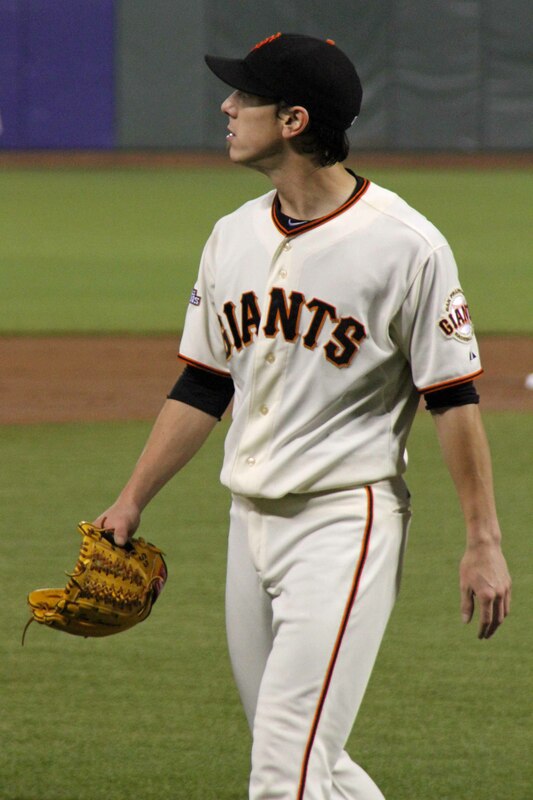 Will Tim Lincecum wear a Giants uniform next season? I hope so. Yes, I have a soft spot for the guy that obviously biases me — but if we fail to keep Timmy… who will we replace him with? His 4.67 ERA is disappointing, yet Matt Cain’s 2013 ERA is 4.53 and Ryan Vogelsong’s is 4.88. And please, let’s not talk about Barry Zito! In other words, it’s not as if pitchers with ERAs in the 2’s are just hanging around, waiting to be signed. (In 2009, when he won his second consecutive Cy Young award, Timmy’s ERA was 2.48.) I sometimes think San Francisco Giants fans are so spoiled by years of great pitching from Lincecum, Cain and Bumgarner, we have lost perspective. So… here’s my humble, biased opinion on the best-case Lincecum scenario: The Giants resign Timmy to a two-year deal, while continuing to nurture prospects and shop for trades. He threw a no-hitter once. And he can ROCK the bullpen, based on his performance last October, so that’s an option if his performance as a starter deteriorates. Let’s remember, Sabean, Baer and friends are businessmen, and Timmy draws crowds and puts cheeks in the seats. Mine, to name just two. As the baseball season enters its final weeks, enjoy these pics. I’ll be on hand for the last Giants game of the season (fan appreciation weekend! ), as is my custom. Madison Bumgarner is slated to pitch. Then… bring on the NBA! The problem with the idea of signing Timmy to a two-year deal – which I think every Giants fan would love – is that someone, his hometown Mariners, the dreaded Yankees, maybe even the friggin Dodgers – are going to offer him a much longer deal. And there’s no good reason for him not to take it. If it’s a choice between a few two-three year deals, then I think he comes back to SF. Otherwise, if he gets a 5-6 year deal, it should be somewhere else. Sadly. Yeah, I know. (*sigh*) It’s funny, why do we (or at least, I) always tell myself that my favorite players on my favorite teams will hang out for more lofty reasons, and forgo money? Also, being a Clevelander I am pretty jaded thanks to LeBron, and wonder if a guy with two rings would take a little less cash if he felt it would improve his chances of winning another WS? So exactly how far do you think the Indians will go? As I’ve learned as a Giants fan, it pays to be an optimist. They came from 3 games back twice last season to win it all. But the Tigers have been our kryptonite all year so, beating them will be tough.